Chinese Foreign Ministry spokesman Hong Lei told reporters on Saturday that Beijing hopes the elections in Afghanistan will help usher in a new era of dialogue, inclusive peace and reconciliation. His remarks came as some seven million people – braving the heavy rain and threat of Taliban violence – voted in presidential and provincial elections at more than 6,300 polling stations throughout Afghanistan. The number of eligible voters was 12 million out of a population of 30 million, however. Although 11 candidates are running for president, most observers in Afghanistan believe the election really boils down to candidates Abdullah Abdullah, Arshaf Ghani and Zalmai Rassoul. Current President Hamid Karzai is obliged by constitution to step down and hand over power. He has run the country since US forces invaded in 2001. 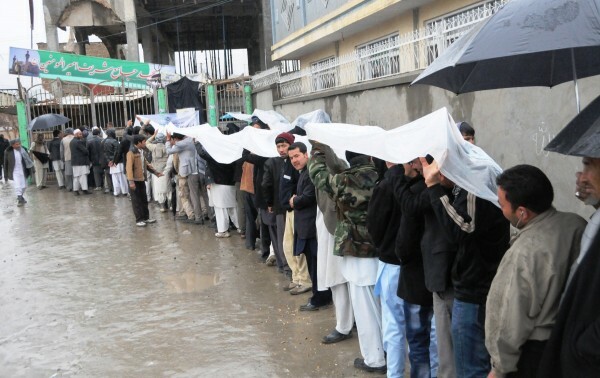 According to the Interior Ministry, some 1,000 polling stations were closed due to security threats from the Taliban; police reports also said that 20 people were killed and dozens more injured in attacks that attempted to derail the election. The Ministry said that its forces killed more than 80 fighters across the country. Meanwhile, Hong said that China, as Afghanistan`s friendly neighbour, respects the Afghan people’ s choice, adding that Beijing believes the election was relatively smooth. Ballots are currently closed and the counting of ballots has begun, Afghanistan’s Election Commission has said. The preliminary results will be announced on April 28. In the meantime, the Commission says it is ready to hold a runoff election should no candidate achieve 50+1 in the results. Earlier in the year, Afghanistan, China, Russia and India held talks to coordinate a unified position on the war-torn nation in Beijing. “The three sides, as close neighbors of Afghanistan, support the reconstruction and reconciliation process of the country and have been involved in safeguarding peace, security and development of the nation and the region,” said a press release.